I have successfully made macarons before, but today was not one of those days. 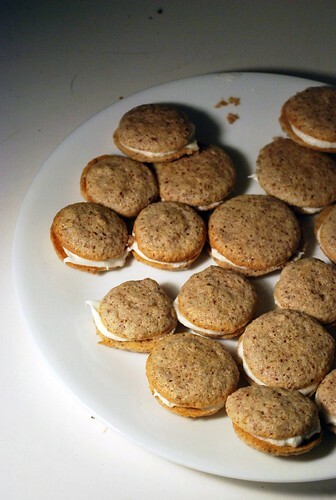 This month we made macarons, one of my favorite cookie sandwiches, but it just didn't work out for me. Don't get me wrong, they were good. But wrong. They were too sticky, didn't have feet, and felt wrong. I usually make the recipe from Gourmet, but I tested out this recipe. It worked for some other people, but not for me. Oh well. 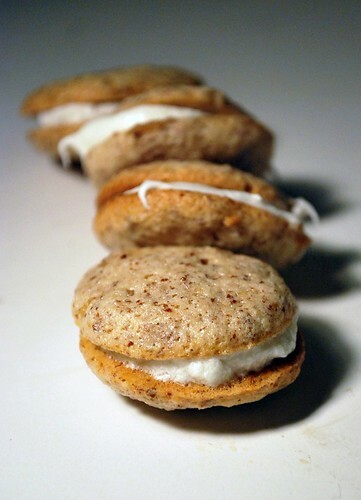 The 2009 October Daring Bakers' challenge was brought to us by Ami S. She chose macarons from Claudia Fleming's The Last Course: The Desserts of Gramercy Tavern as the challenge recipe. I won't be posting the recipe because it's posted everywhere else, but just because it didn't work out for me don't think it won't work for you! The 99% humidity here probably has something to do with my failure, too. I have yet to try macarons, but it's very much on my list. I bet these still had a wonderful flavor! Well I think they look lovely =D. Great job with this challenge! These look fab!! Finally I've found someone who's efforts looked a bit like mine! Although yours are clearly better. I was doing my macarons at about 10pm on the final day before the deadline!